30 spots are available for the next Bully Prevention Seminar held at the Pershing Recreation Center on Saturday, Feb 2 from 1:00- 3:00 pm. The seminar is FREE to attend for students ages 6-13. Parent volunteers are welcome and appreciated! Lakes Martial Arts students should wear their uniform. This will be extra special, as we are joining forces with Pursuit Martial Arts to stop bullying in schools. Students will earn a special green stripe on their belt for participation, along with some goodies to reinforce the skills learned in the seminar. Returning students welcome to assist with leadership skills. Wear uniforms and bring a friend! Parents are strongly encouraged to participate. No sign up sheet need. Just show up with a great attitude! Over 175 students have participated in the bully prevention seminars since 2015. I’m proud of the success stories that have come from the efforts. Hope to see you and a friend on the mat! PS- Mr. Kern will also bring his photo studio (and smoke machine) to create another series of “Confidence Portraits” at no charge. Minneapolis kids helps prevent bullying! OVER 175 STUDENTS HAVE PARTICIPATED IN THE BULLY PREVENTION SEMINARS AT LAKES MARTIAL ARTS SINCE APRIL 2015 PLUS OVER 500 KIDS THROUGH THE MINNEAPOLIS SAFETY CAMP HELD EACH SUMMER. JOIN US TO PUT AN END TO BULLYING! Congrats to the 9 student participants who completed the FREE Agent G Bully Prevention seminar on Saturday, January 27, 2018. And special thanks to the two adult volunteers (Mr. Chris Just and Mr. Mike Nielsen) and sponsors including the Fulton Community Association grant, the Minneapolis Parks & Recreation Board, and Lakes Martial Arts. Each participant received their own "Agent G" kit after completion of the 2-hour seminar which also included a board break confidence drill. This is my gift you, parents, for your support in our program! I had a wonderful time and share three of the portraits.... please welcome new leadership team members Alexander and Jude! Enjoy the holidays and remember to stay strong! This year Lakes Martial Arts is donating 100% proceeds of sales in our online store to bully prevention in our community. This means we will be able to continue our efforts to stop bullying, one of the biggest issues facing schools today. On Black Friday, Lakes Martial Arts is donating 100% proceeds of sales in our online store to bully prevention in our community. We want our customer to show love to our community. With your support, we will be able to continue our efforts to stop bullying, one of the biggest issues facing schools today. The Journal of the American Medical Association estimates that one-third of school-aged children in the United States are affected by bullying every year. Bigger life problems such as lower grades, poor self-esteem, depression, and thoughts of suicide result. 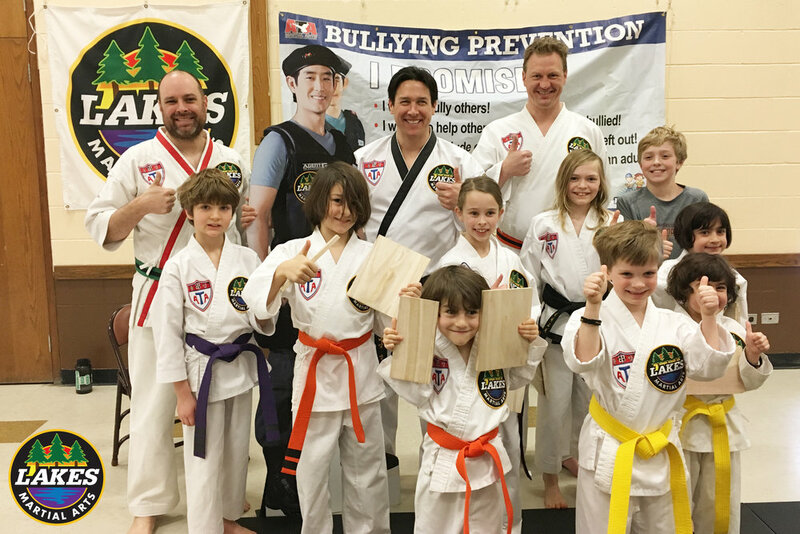 Through affiliation with the Olweus Bully Prevention Program, Lakes Martial Arts has partnered to spread positive impacts in the community. 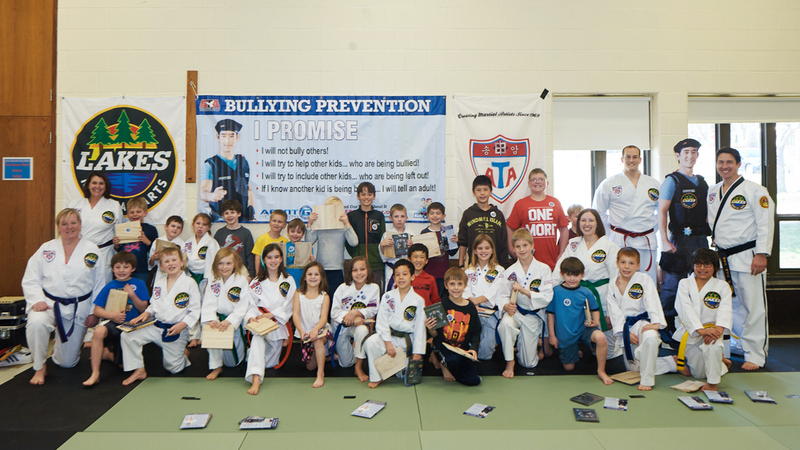 Since 2015, over 700 students have been able to learn from Lakes Martial Arts about bully prevention. We have partnered with Minneapolis Safety Camp and the Minneapolis Parks & Recreation Board to deliver programing quarterly to the community at no charge. Funds provided by the Fulton Community Association grant and a fundraiser in conjunction with Lululemon Galleria were successful in raising over $2500. By offering free 90-minute bully prevention seminars is one simple way to make a difference. For every $35 raised, one student is able to receive the full benefits of the seminar which includes the “Agent G kit” each student recieves helps to re-enforce the concepts at home and school. These kits have proven valuable with numerous case students to demonstrate effectiveness. More seminars >> more kids >> greater awareness >> less bullying. SUCCESS! Donating is a great way to get involved, too! At special screening as part of the Lakes Martial Arts Open House 2016, students watched the debut of the very first promo video by Penn Barnes, the brother of one of our very own student's, Ms. Barnes. Penn is a buddying photographer and cinema photographer with curiosity, enthusiasm, and fresh energy. He is hard-working, friendly, is not afraid to do his best. I don't know many high school kids that have earned a PBS video credit, too! I greatly appreciate his efforts and have enjoyed getting to know him over the past few months and look forward to future creative collaborations. On Becoming a Lakes Martial Arts Black Belt, a short film by Penn Barnes. The short film showcases a behind-the-scenes glimpse of Lakes Martial Arts students training at the ATA club at Pershing Recreation Center in Minneapolis, Minnesota. Leadership team members Ms. Barnes and Mr. Kamrow completed their training and successfully tested last July for their the rank of first degree black belt decided. Rewind three years ago, they began their training with Mr. Kern at Lakes Martial Arts as white belts. It has been an amazing journey to watch them grow and develop as good citizens and young martial artists. They continue to set good examples to students and their leadership is greatly appreciated. Rewind back to color belt testing on February 2014, pictured bottom row, Ms. Barnes as an orange belt, and Mr. Kamrow and Nora as yellow belts! Wow! They grow up so fast! Featured on Twin Cities PBS! Minneapolis martial arts students were featured this week on Twin Cities PBS as part of Mr. Kern and Lakes Martial Arts being featured on MN Original, Artist Day Jobs. As the symbolized in the Korean flag, a yin / yang represents an eternal duality in life. Working and playing, serving an important role of being a well-rounded citizen. 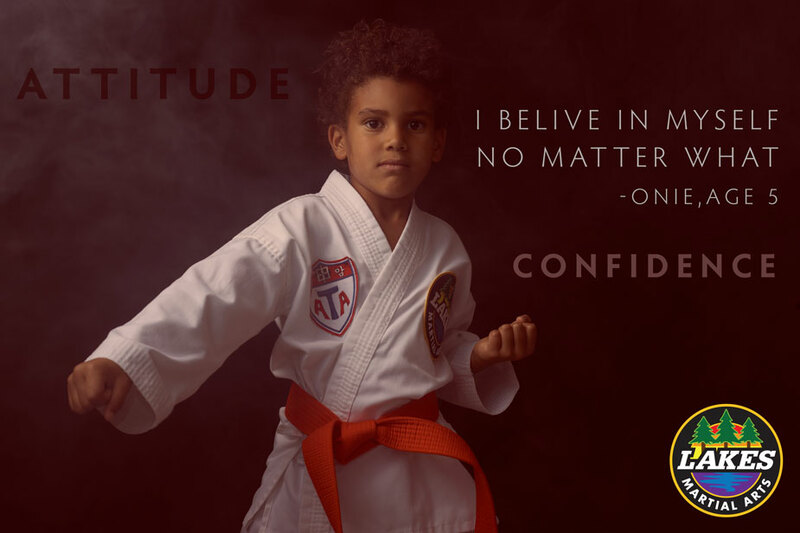 Students at Lakes Martial Arts are encouraged to be active citizens in their community, do well in school, balance family and friendships, and try their best. These skills are what they really learn in our program, as well as kicking and punching and having fun! The support of this project made possible by the Minnesota State Arts Board Artist Initiative Grant. Special thanks to Scott Stebner for helping me understand the agricultural photo world, Matt Steaffens for his patient listening ear, Stuart Klipper and Kathleen Richert for their trusted guidance, Penn Barnes for the additional footage, and my wife and family for their loving support. Special thanks to Sylvi for reminding us to smile each day, every day. Sylvi, I appreciate your thoughtful "Perfect Class" gift! If you were to dream up the perfect martial arts class, what would activities would you choose? What would it feel like? What would look like? I asked our leadership team this question and gave them a few days to think it over. The results surprised me. V-sits and flutter kicks are Otto’s favorite drill. He loves board breaks and earning a stripe, too. Endorphins really motivates Clay. He loves physical challenges in class and that post-euphoria feeling. Sylvi loves learning new technical moves. Jessica loves working out and earning the feeling of accomplishment of meeting a particular goal. Fitness tests are a few of Alex’s favorite activities. Nora loves high kick challenges and feeling good after each class. No two students shared the same activity, one of the reasons variety tends to appeal to my favorite classes (For the record, I always thought it would be cool to have a class where I got to experiment with ALL the weapons and create new moves... which we did in class this week!). So how do you pack all these fun possibilities into a 45-minute class? Talk with your instructor after class and let them know your favorite things you did also helps them plan future fun classes. Instructors love to see their students having fun. No one likes a dull, repetitive class. If you love pizza, an all-you-can-eat buffet without pizza wouldn’t be fun, would it? 10. A healthy body and mind to challenge during exercise. 9. Good Zebra mats for safety and comfort. 8. Thoughtful students that make cool thank you notes and cards as gifts. Those melt my heart! 7. Amazing instructors like Mr. Gonzalez, Mr. Ken Hoops, and Mr. Deutschman and who have helped teach classes for us this year along with the support of the Leadership Team members (Alex, Nora, Sylvi, Otto, Owen, John, and Jack). 6. Lysol for sweaty sparring gear! Good laundry detergent and a washing machine. Otherwise white uniforms would be about brown or even black! 5. A phenomenal Rec center walking distancing from many student’s homes! 4. Imaginative student’s who create taekwondo obstacle courses in living rooms and re-glue boards! 3. My supportive wife, Krista, and our family for the numerous times they’ve had to watch our little one during class. 2. That they really do make parents stripes in 14K gold. 1. Loyal and supportive parents serve as the their “third tree” as represented on our patch! Have a wonderful thanksgiving and enjoy your family time! If you'd like to add to the list, please share a comment! Congrats to the new ranks of color belts at our Fall 2015 testing held on November 18. We had a packed house of supportive parents. The room was filled with tons of positive energy! Special congrats to both Alex and Nora for earning their leadership uniform! Thank you to guest judges Master Blomquist, Mr. Gonzalez, Mr. Deutschmann, and Clay Hogen-Chin for your support and encouragement to the testers and making the largest testing panel to date! Next session starts Dec 2. Have a wonderful Thanksgiving and enjoy the time with family and friends! Lakes Martial Arts Fall Testing 2015 in Minneapolis, MN. Today's leaders have a responsibility of shaping tomorrow's leaders. Demonstrating excellence in teaching leaders of today and tomorrow are one of the biggest rewards teaching in the American Taekwondo Association. Strong parents make strong kids. Strong parents make wonderful examples for their kids, making communities stronger. Clay and Jessica are wonderful role models of excellence for all Lakes Martial Arts students. Good news: Mr. Kern passed his first mid-term towards 5th degree (it takes at least three weeks to find out... Master Blomquist shared the good news after testing... Thank you, Sir). Read more about his journey at the 2015 ATA Fall Nationals in Orlando here. Parents: while you may not be in every photograph, you are always in the big picture! When I see students demonstrate skills out in the real world, that puts a smile on my face! These fleeting moments occur when we least expect. Like when a student holds the door open for a stranger, offers to help tie a belt with a beginner student, or offers to helping to set the dinner table. These tiny efforts make a big difference in our world. The result: we build a stronger community. When I see student photos demonstrating these efforts, that goes a long way in my book! Like practicing on vacation, or deciding to compete at a tournament for the first time. These efforts showcase commitment and passion: important ingredients for a leader today. Andrew & Shayna, both Lakes Martial Arts Karate Kids, went to Orlando to visit family in March and practiced on the beautiful Cocoa Beach. What a great way to celebrate their first time to the ocean! Nora and Alex brought home hardware competing at their first martial arts tournament recently. Parents, without your support, none of this would happen. THANK YOU! Thank you for cheering them in the front row of life and supporting the Lakes Martial Arts community in Minneapolis!